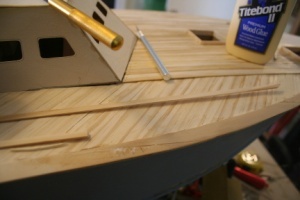 The second layer of deck planking was laid longitudinally. 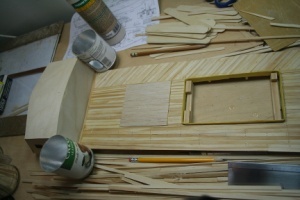 First, the large access hatch was planked separately, and the planks were extended out from the frame of the hatch along its length to form an overlap along the side, and also extended from the rear of the hatch to the edge deck plank along the transom. 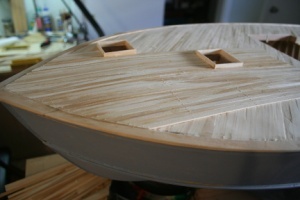 Once the hatch was planked, it was replaced into the opening and the remainder of the deck planked. Hatch coamings were built up using wood for the forward hatches, and laminated card stock for the engine room cabin hatch. This hatch coaming also had wooden blocks placed so the hatch cover can be screwed down during operation. This hatch is planned to be the main access for batteries, receiver, motors, etc at later stages of construction. Planking was carried around the cabin and turrets. 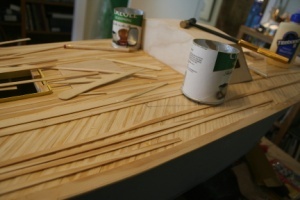 Planking was glued down and also secured with wooden pegs. The pegs were made by splitting wooden tongue depressor sticks with a knife and then tapering them to a point. These wooden pins were then dipped in glue and gently hammered into a hole in the deck plank and deck beam drilled with a #65 drill.